Samuel Badree is a West Indies cricketer, who is considered one of the craftiest bowlers. He is a right-hand leg spinner and right-hand batsman. Badree is considered one of the most effective bowlers in shorter formats of the game. He has thrived in franchise-based leagues around the globe. Badree was born on 8 March 1981 in Barrackpore, Trinidad and Tobago. He made his domestic debut for the Trinidad and Tobago cricket team in 2002. Before his journey to international cricket limelight, Badree was a physical education teacher. Badree does not turn the ball much, but his accuracy makes his balls difficult to play. Badree made his international debut against New Zealand in June 2012 in Lauderhill, USA at a ripe age of 31. He did not disturb the wickets’ column but bowled a decent spell. He has only represented the Windies in T20s. Badree made a decent entry to the international scene. But a fantastic 2012 World T20 campaign drew the attention of franchises around the world. His neat opening spell in the finals against Sri Lanka gave West Indies the impetus to defend a modest total. Badree set the 2014 World T20 ablaze producing his career best figures of 4/15 against Bangladesh. He wrecked Pakistan top order in yet another memorable performance in the tournament. Windies crashed out in the semis after losing to Sri Lanka which meant Badree ended the tournament with 11 wickets in five matches at an astonishing economy of 5.65. Yet another impressive campaign in 2016 World Twenty20 rocketed him to the top of T20 bowling charts for a time. He played for World XI against Pakistan in Lahore in 2017. Badree missed a large part of 2015 and early 2016 due to injury. Questions were raised about his inclusion in 2016 World T20 squad. But Badree made an impressive return and showed no signs of rustiness. Consistency in restricting run flow makes Badree a huge asset in T20 which explains the prolific statistics in the shortest format. He has experienced success in T20s around the world. His career kick started after his fantastic performances for local team Trinidad and Tobago. Since then, he has played for Khulna Royal Bengals (2013) and Rangpur Riders (2017) in Bangladesh Premier League, Brisbane Heat (2015) in Big Bash League, Islamabad United (2016) in Pakistan Super League and Rajasthan Royals (2013), Chennai Super Kings (2014) and Royal Challengers Bangalore (2017) in the Indian Premier League. Interestingly, he remained unsold at the 2018 IPL auctions. Badree has taken 54 wickets in 45 international T20 appearances for West Indies and his economy rate is under six. He has numerous achievements at club levels too. He took a hattrick on his debut for RCB in 2017 IPL against Gujarat Lions. 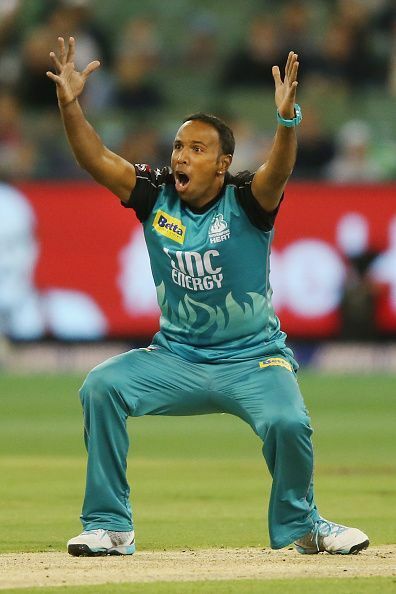 He produced his best bowling figures of 5/22 for Brisbane Heat against Melbourne Stars in 2016. Pakistan vs West Indies, T20I: Hits and Misses from the series.